Everyone knows Friday the 13th is considered an unlucky day. Today will be your lucky day if you book a Mystery Shop show. Any show BOOKED today (for any date) will receive 13% off your next show! How lucky is that? But why does Friday the 13th have such a bad reputation? One reason is that both Friday and the number 13 have some troubled ties to Christianity. It was on a Friday that Jesus was crucified, and ever since, the day has been associated with “general ill omen,” Michael Bailey, a history professor at Iowa State University who specializes in the origins of superstitions. In the Middle Ages, for instance, weddings were not held on Fridays; likewise, it was not a day someone would set out on a journey, Bailey says. Friday was also unlucky in medieval times because it was “hangman’s day,” says Stuart Vyse, a psychology professor at Connecticut College. As for the number 13, Vyse says, seating 13 people at a table was seen as bad luck because Judas Iscariot, the disciple who betrayed Jesus, is said to have been the 13th guest at the Last Supper. It’s unclear exactly when Friday and the number 13 became linked, but there are no mentions of Friday the 13th before the 19th century, Bailey and Vyse say. In 1907, Thomas Lawson wrote a book titled Friday, the Thirteenth, which described a stockbroker choosing this day to bring down Wall Street. More recently, the Friday the 13th slasher-movie franchise, which started in 1980, further solidified this day’s notoriety. Vyse, who specializes in the psychology of superstitions, says these kinds of beliefs are a way for people to “control the uncontrollable” and manage the anxiety that comes with uncertain situations. 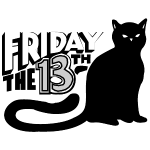 Although there’s evidence that believing in lucky symbols is beneficial, taboo superstitions such as Friday the 13th represent a kind of phobia, Vyse says. In fact, fear of Friday the 13th has a name: paraskevidekatriaphobia. Today will be your lucky day if you book a Mystery Shop show. Any show BOOKED today (for any date) will receive 13% off your next show!